Mystery Skype. A truly collaborative event. Last week, the ENG3C class participated in a Mystery Skpye. What an adventure! 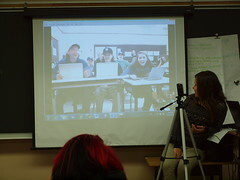 A Mystery Skype is an online event held through Skype in which neither group knows where the other group is in the world. Through a series of closed questions (yes/no), participants piece together where they are calling from until one group guesses the correct location of the other group. This opening exercise was certainly a fun and engaging way to set the stage for the real purpose of the call: a conversation between teens about their lives. As the conversation about First Nations people grows in the public domain, more and more people are realizing that they do not know very much about First Nations people or the issues emerging from their communities. What interferes with the general public’s understanding of First Nations’ issues is the ongoing use of First Nations’ stereotypes, and this is a topic that some educator’s meet head on in their classrooms. Sarah Le from Orangeville District Secondary School is one such teacher. Through a variety of texts, Mrs. Lee, pushes her students to understand the multiple perspectives that must co-exist in our society, including that of First Nations, Inuit, and Metis peoples. Our camera person listening intently for the next question. The Skype went off…with a couple of hitches. We were met with the challenge of acquiring the right gear (external webcam and tripod), finding an Internet signal that would give us enough bandwidth to enable the video to work, and overcoming our shyness and nervousness to both be on camera and to think on the spot! But we did it. We had coaches scrounging up the gear for us and teaching me how to get the technology ready, we had students problem solving how we might solve our weak Internet issue, and we had students who stepped up to the plate at the last second to take on larger roles than they had originally prepared for. What’s the definition of collaboration? To create something together that we could not create individually. We certainly nailed collaboration in this event! When the Skype call ended, the first question we had was, “When do we do this again?” We were energized and engaged, and we wanted more. Our reflections about this event are ongoing. Students are / will be posting to their own blogs using the “What? So What? Now What?” reflective model. How did the experience relate to your coursework? What can be done to improve this type of work?